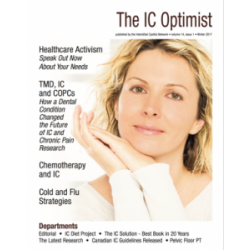 This Spring 2017 issue of the IC Optimist is a veritable potpourri of IC and pelvic pain stories. 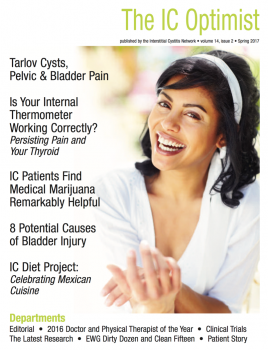 Physical therapist Elizabeth Rummer contributes a feature story on Tarlov Cysts, a hidden source of pelvic and bladder discomfort. If you struggle with hypothyroidism, you are certainly not alone. 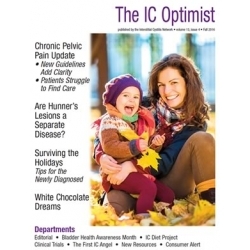 Melissa Hines PT discusses how thyroid disorders can play a role in persistent pain disorders. This is very, very common in the IC patient population. We share the results of a 7 year study on the use of medical marijuana and IC with more than 600 participating patients report remarkable success reducing bladder pain and other symptoms. The 2016 MD and PT of the Year Awards are revealed. 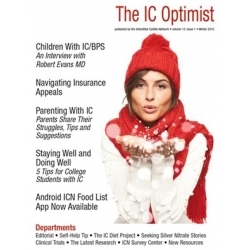 You'll also find the latest clinical trial announcements and research. Barbara Flanigan provides an update into her work with porphyria and IC. If you've wondered how your IC may have started, our self help tip reveals eight potential causes of bladder injury. Author Bev Laumann celebrates Mexican cuisine with three bladder friendly recipes from the IC Diet Project.